Winston Churchill - Was he really an alcoholic? Was Winston Churchill an Alcoholic? "You, Mr Churchill, are drunk." "And you, Lady Astor, are ugly. But I shall be sober in the morning." Photo: Winston Churchill—courtesy of Franklin D. Roosevelt Presidential Library & Museum. This infamous exchange was the incident that confirmed Winston Churchill's reputation as a heavy drinker. It all started back in 1899. Churchill, aged 25, was a correspondent on the Morning Post, covering the Boer war. Sent out to the front line, he took with him 36 bottles of wine, 18 bottles of ten-year old scotch, and 6 bottles of vintage brandy (a drink he believed was essential to a staple diet). Clearly Churchill had better access to alcohol than most people on the South African front: his stores were said to contain "many bottles of whiskey, claret, and port." Over the next few decades, Churchill's name came to be linked with two things: drink and war. They were often closely connected. In 1915, many people considered England's future leader exceptionally brave when he opted for the front line; as an aristocrat, he could have chosen a safe post at headquarters. But as a close friend pointed out: "Hard liquor was prohibited at Battalion HQ… and only sweet tea provided, a beverage by no means to Winston's taste." Churchill could never have given up drink; that much was confirmed by another wartime episode. When George V set a personal example to the troops by giving up alcohol, Churchill declared the whole idea absurd and announced he would not be giving up drink just because the King had. Even as Prime Minister, Churchill refused to moderate his drinking. He believed Europeans liked leaders who could hold their liquor, so he did nothing to discourage rumors about his alcoholic excess. Churchill admitted he relied on alcohol. He always had a glass of whiskey by him, and he drank brandy and champagne both at lunchtime and dinner. 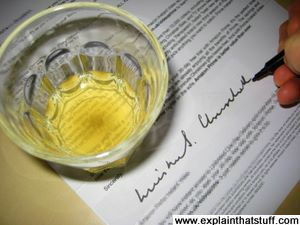 Only when Churchill reached the age of 76, in 1953, were there signs of change: "I am trying to cut down on alcohol. I have knocked off brandy and take Cointreau instead. I disliked whiskey at first. It was only when I was a subaltern in India,and there was a choice between dirty water and dirty water with some whiskey in it, that I got to like it. I have always, since that time, made a point of keeping in practice." In the 10 years of retirement before he died, Churchill drank more than ever. He never missed having a bottle of champagne for lunch and very often had another one for dinner. One visitor from the period noted: "There is always some alcohol in his blood, and it reaches its peak late in the evening after he has had two or three scotches, several glasses of champagne, at least two brandies, and a highball… but his family never sees him the worst for drink." That was the most remarkable thing about Churchill: he always seemed perfectly sober. Raised as an aristocrat, he believed drunkenness to be contemptible and disgusting, and a fault in which no gentleman indulged. But was Churchill an alcoholic? He drank so much for so long that, in the end, no-one could really tell. But how you drink is more important than how much. Drink with meals and with company. Don't get caught buying rounds – you can end up drinking six pints when two would do. And if you plan a long drinking session, make every other drink a non-alcoholic one. That way, as Churchill once said, you will "take more out of alcohol than alcohol takes out of you." You might find it amazing—or perhaps even slightly amusing—that one of the greatest leaders in history lived his life under the influence of alcohol. Churchill was lucky: alcohol didn't destroy him or the lives of the people around him; doubtless, on occasions, it helped him to cope with the incredible pressures he faced. Many other people aren't so fortunate: alcohol frequently turns them into abusive, violent monsters, tears apart their families and drives away their friends, before killing them, slowly and painfully, with a toxic cocktail of horrible diseases. Perhaps even more wretchedly, some alcoholics become drink drivers who kill, maim, and blight the lives of unlucky people they don't even know. According to the World Health Organization, alcohol kills 3.3 million people each year—that's over 1000 times as many people as died in the terrorist attacks on September 11, 2001, every single year . ↑ Alcohol, World Health Organization. The 2012 figures quoted are the latest available on the page as of March 2019. ↑ Global burden of disease and injury and economic cost attributable to alcohol use and alcohol-use disorders by J.Rehm et al, The Lancet, 27 June 2009. and Alcohol, World Health Organization. ↑ Government expenditure on education, total (% of GDP), World Bank Databank, 2018. ↑ Alcohol and Crime: An Analysis of National Data on the Prevalence of Alcohol Involvement in Crime by L.A. Greenfield, Bureau of Justice Statistics, 1998. ↑ Alcohol, drugs, and crime: NCADD, 2018. ↑ Alcohol Consumption and Traffic Crashes by Professor David J. Hanson, Sociology Department, State University of New York. ↑ Reduce your risk: new national guidelines for alcohol consumption: Australian Government, November 2013. ↑ Alcohol attributable burden of incidence of cancer in eight European countries based on results from prospective cohort study by Madlen Schütze et al, BMJ, 7 April 2011. Global alcohol-attributable deaths from cancer, liver cirrhosis, and injury in 2010. by J. Rehm and K.D. Shield. Alcohol Res. 2013;35(2):174–83. For a more general discussion, see Does alcohol cause cancer?, Cancer Research UK, December 28, 2018. ↑ Alcohol and crime: by L.A. Greenfield, Bureau of Justice Statistics, 1998. [PDF file] Alcohol Related Crimes, Alcohol Rehab Guide/Delphi Behavioral Health Group, December 10, 2018. ↑ More than 40% of domestic violence victims are male, report reveals by Denis Campbell, The Guardian, 5 September 2010. According to a 2014 report on Alcohol, Domestic Abuse and Sexual Assault by the Institute of Alcohol Studies: "Typically between 25% and 50% of those who perpetrate domestic abuse have been drinking at the time of assault, although in some studies the figure is as high as 73%." ↑ Statistics: how common is domestic violence? : Women's Aid, 7 August 2006. 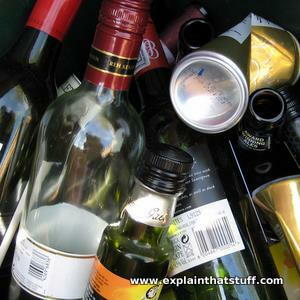 ↑ How much money did you spend a week on alcohol? : Soberrecovery.com forum discussion in 2009. ↑ Alcoholism Risk Factors: Mayo Clinic. Churchill: A life by Martin Gilbert. Pimlico, 2000. 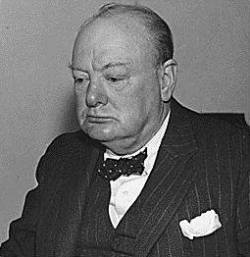 Martin Gilbert is Churchill's official biographer and has written numerous volumes of definitive biography. This search will bring up everything he's written on Churchill (everything that Google knows about, anyway). Churchill: A Biography by Roy Jenkins. Macmillan, 2001. A more manageable alternative to the multi-volume Gilbert works (but still a hefty 1000 pages!). Drunks: The Story of Alcoholism and the Birth of Recovery by Christopher M. Finan. Beacon, 2017. A compelling history of alcoholism and recovery from the 17th century onward, including AA and the alcohol recovery movement. Alcoholism: The Facts by Ann M. Manzardo et al (eds). Oxford University Press, 2008. Expert information, succinctly presented. NHS: Alcohol Support: Official information from the UK's National Health Service. Alcohol and Your Health: Research-based information on drinking and its impact: Facts and statistics from the US National Institute on Alcohol Abuse and Alcoholism. Alcohol: Health Canada's collection of official advice. Alcoholics Anonymous: The world's best-known support group for alcoholics and recovering alcoholics. Al-Anon Family Groups: Help and support for the families and friends of problem drinkers. UK: National Domestic Violence Helpline: Confidential help for the victims of domestic violence and abuse.